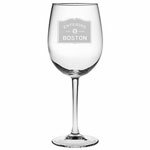 Set of four 21-ounce Boston stemless wine glasses standing 4.63" high. 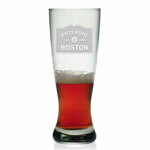 The "Entering Boston" image is permanently sand-etched onto each glass using a process involving the abrasion, or roughening, of the surface of glass. Stemless design is suitable for all beverages. Dishwasher safe. Dimensions: 4.63" H x 3" W x 3" D.